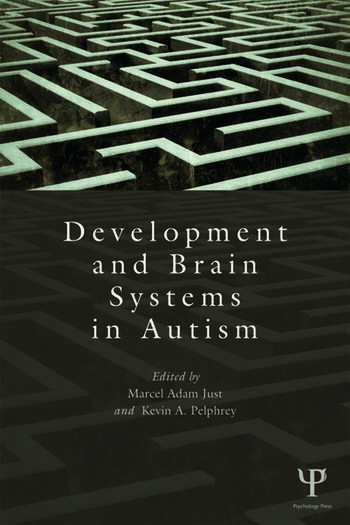 Cognitive and neural systems development: how autism arises in the behavior and thought of very young children. Discovering brain mechanisms underlying social and cognitive deficits in autism: how we can explain "social awkwardness" and poor language comprehension in terms of malfunctions of brain mechanisms, revealed by fMRI studies of people with autism. Integrating information about genes, brain, and biological mechanisms with behavioral evidence. Linking the science of autism with lives lived: how the new information about autism impacts people with autism and real-world considerations. Part 1. Lives Lived with Autism. Grandin, T., My Experience with Visual Thinking and Sensory Oversensitivity: The Need for Research on Sensory Problems. Hippler, K., Hans Asperger’s Patients Growing Up. Part 2. Brain Mechanisms and Genetic Influences. Just, M.A., Keller, T.A., Kana, R.K., A Theory of Autism Based on Frontal-Posterior Underconnectivity. Scott-Van Zeeland, A.A., Bookheimer, S., Implicit Learning and Reward Systems Deficit in Autism: A Mechanism for Social Learning Deficit? Geschwind, D.H., Autism Susceptibility Genes and Normal Variation: Connecting Genes to Brain Structure and Function. Part 3. Developmental Processes in Autism. Bryson, S.E., What Do Early Signs Tell Us about the Developmental Roots of Autism? Jones, W., Klin, A., Social Engagement in the First Two Years of life in Autism Spectrum Disorders. Part 4. Neural Systems in Social and Emotional Processes. Pelphrey, K.A., Perlman, S.B., Vander Wyk, B.C., Brain Mechanisms for Social Perception Dysfunction in Autism. Kana, R.K., Klein, C.C., Klinger, G.L., Travers, B.G., Klinger, M.R., Neural Representations of Self versus Other: Lessons from Autism. Moss, J., Wicker, B., Brain Connectivity and Emotional Processing in Autism. Part 5. Overview. Minshew, M.J., Mazefsky, C.A., Organizing Principles For Autism Research: Where Do We Go From Here? Marcel Adam Just is the D. O. Hebb Professor of Psychology at Carnegie Mellon University. His brain-imaging research investigates the biological mechanisms underlying the altered psychological processes in autism. His autism research has made several fundamental discoveries concerning differences in brain function, including findings of alterations in synchronization, in white matter communication tracts, and in the balance of frontal versus posterior activation. Kevin A. Pelphrey is the Harris Associate Professor of Child Psychiatry at the Yale Child Study Center. His research addresses fundamental questions regarding the typical and atypical development of brain mechanisms for social cognition in children with and without autism spectrum disorders.